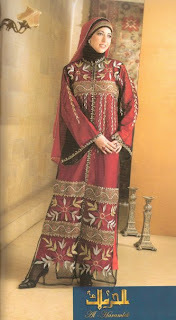 Jalabiyas (or galabiyas as the Egyptians would say :D) are dresses that are popular across the Middle East, and often worn at home when entertaining guests or at parties. 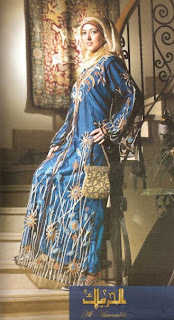 These ones were featured in Hijab Fashion Magazine, from a store called Al-Haramlek. 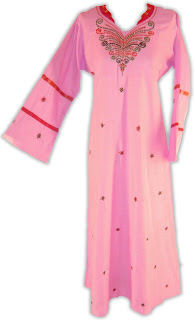 i have this pink and white one!!! i love it and it took about 1 week for them to ship from egypt to australia!!! I TOTALLY adore the golden and dark blue one, at the top! Amazing style! Jalibiyias are my favourite thing in the world to wear. i feel like a princess, and yet oh so comfortable. Kholod, I love them all! I wish Al-Haramlek had a website. Anon, I was thinking maybe it's a hood? Sis, I've ordered from their sister site, 2hijab, and I wasn't charged customs. 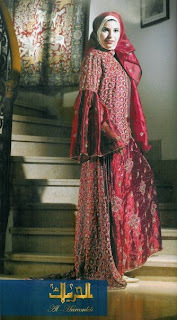 I realise this is me being totally ignorant - but I'm confused by the various dress-like pieces of Arabian clothing... are these intended to be garments which one might be seen wearing in public (they do appear to cover all the parts of the body I would consider it necessary to cover) or is it usual to wear some other garment over them when going outside? Anon, these particular ones are meant to be worn in the home, or at parties - they're far too nice to be walking the streets with! i disagree... i wear my pink one everywhere!! i dont save my special pieces for special occassions.. i wear them everywhere..
i go grocery shopping in them too. I still have several from my last trip to Egypt (where the prices are SO much lower), although most are not as fancy as this. I wear them around the house all the time, so comfortable! I don't wear them out much because I work in a Western environment, so I go with something more like the outfits that Jana regularly comes up with. Wow, those are beautiful. I was in Egypt for some time and I didn't see them in the streets for sure, at least not this beautiful. Ange, where did you order yours? 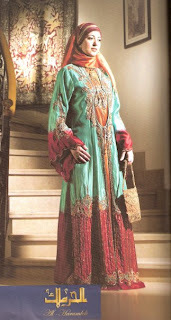 I've been going crazy trying to order one from morrocco for an upcoming wedding! !